Alexander James is an artist wholly dedicated to his work, in a particularly literal way. 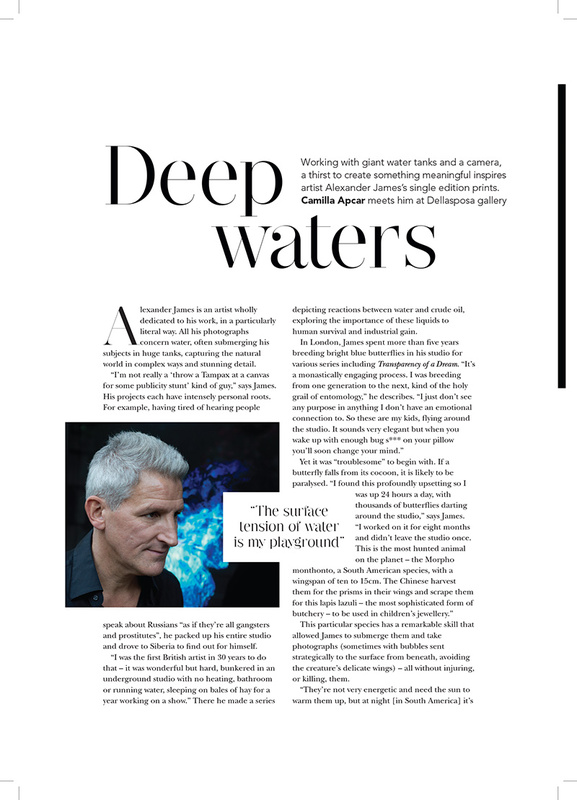 All his photographs concern water, often submerging his subjects in huge tanks, capturing the natural world in complex ways and stunning detail. “I’m not really a ‘throw a Tampax at a canvas for some publicity stunt’ kind of guy,” says James. His projects each have intensely personal roots. For example, having tired of hearing people speak about Russians “as if they’re all gangsters and prostitutes”, he packed up his entire studio and drove to Siberia to find out for himself. “I was the first British artist in 30 years to do that – it was wonderful but hard, bunkered in an underground studio with no heating, bathroom or running water, sleeping on bales of hay for a year working on a show.” There he made a series depicting reactions between water and crude oil, exploring the importance of these liquids to human survival and industrial gain. James would drop the room temperature using air conditioning and choose his unconscious specimens to photograph. The butterfly would have no brain function until the temperature rose. “The surface tension of the water is my playground,” the artist describes. The camera is held out of the water, looking directly down into five or six-ton water tanks. To James, the creation inside is the real artwork, and photography merely helps to “solidify” it. Some of the prints were produced years ago, but a series that takes a more political stance, The Death of the Dream of Democracy, was made this year. 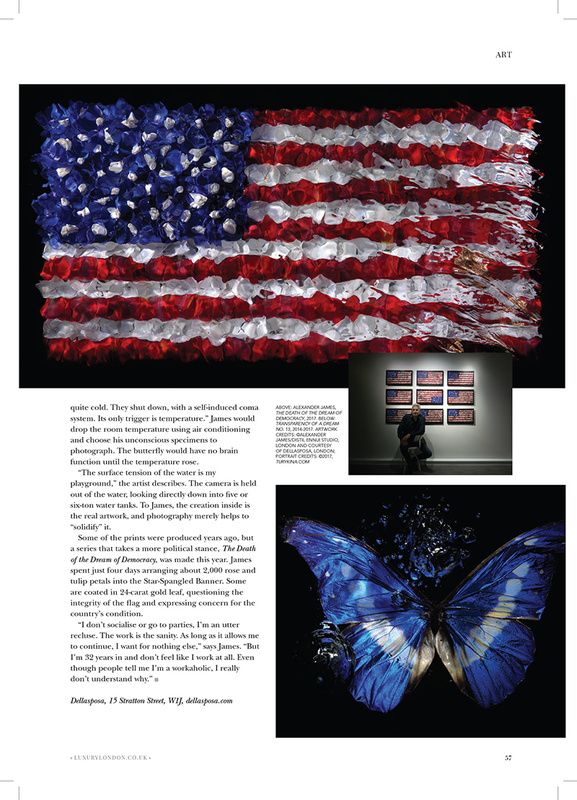 James spent just four days arranging about 2,000 rose and tulip petals into the Star-Spangled Banner. Some are coated in 24-carat gold leaf, questioning the integrity of the flag and expressing concern for the country’s condition.